The sweet scent wafted through the cafeteria. It was that heady aroma of frosted cookies, Hawaiian Punch and childhood adrenalin. The backdrop: Red, lots of red, and a sea of hearts. 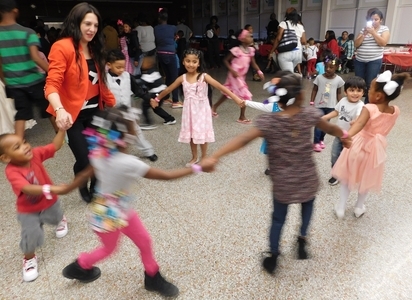 The third annual Valentine’s Day Dance at George Washington Carver Learning Center cranked into drive Thursday, Feb. 11, 2016. The dance, part of Big Thought’s Thriving Minds After School program at Carver, attracted 315 attendees, including kids from pre-kindergarten to 5th grade, parents, teachers, volunteers and the thumping beats of DJ Flip. For two hours, late afternoon to early evening, kids got to shed their uniforms and don their Sunday best. Dresses, hair bows, bow ties, vests, lacquered shoes, stockings and pin-striped slacks gave the children a new look, a new attitude and a chance to let loose with classmates. This being a Valentine’s Day Dance meant you needed a Royal Court. There was a duke and duchess for 3rd grade, a prince and princess for 4th grade, and a king and queen for 5th grade. Teachers nominated one male and one female student each based on attendance (5 absences or less), good character, grades (C average or higher in all classes), and positive behavior. Each nominated student was then asked to write down three reasons why fellow students should vote for him or her at the dance. Teachers manned the voting booth, a colorful candy hearts themed station that drew a steady stream of kids casting ballots. The votes were tallied and it was time for the winners. All members of the George Washington Carver Learning Center’s Carver’s Royal Family received certificates of distinction. The winners were: Duke Jordan Smith and Duchess Kyndall Carroll; Prince Kenyon Valentine and Princess Hailey Lewis; King Stephen Lampkins and Queen Tanija Jones. The crowd roared during the crowning. There was major excitement in the room especially since the dance contests had just stirred all of the kids into a dancing frenzy. Nothing gets kids going like dancing, agrees Brooke Scott. Her children, Kayla Scott, 7, and Travis Ridge, 10, were at the dance. They are Thriving Minds kids who have been active for three years. Kayla takes dance classes while Travis goes for basketball. Scott says that both teach valuable teamwork. Big Thought and Thriving Minds thanks local sponsors Mercy Street, Serve West Dallas, ARK, Readers 2 Leaders, Park Cities Presbyterian Church, Southern Methodist University, Capital Bank, Girls Scouts of North Texas, Jargon Group, Boys Scouts of America, Junior Players, Watermark Church, Lakewest Family YMCA, and West Dallas Community Centers for their generous support. Giving back is always important, no matter the age. Dallas is teeming with young couples (and singles, too!) that earn a good living in rewarding careers. So it’s no surprise that the city is following the national trend of youth philanthropy. According to the 2014 Millennial Impact Report, 87% of millennial employees donated to a nonprofit organization in 2013, while 97% of millennials prefer using their individual skills to help a cause. 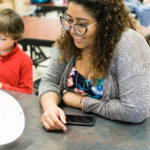 In Dallas, philanthropic groups of young professionals are currently active with nonprofits such as United Way, American Red Cross, Dallas CASA, Ronald McDonald House and Texas Scottish Rite Hospital for Children. Now we can add Big Thought’s Young Professionals Group. Big Thought’s Young Professionals Group aims to fervently bring awareness to the opportunity gap that disproportionately affects our most underserved youth. We believe that equitable education coupled with the power of the imagination can inspire, empower and unite Dallas’ most vulnerable children and communities. To ensure these kids have bright futures, our group of passionate professionals in their mid-20s to early 40s combines mission-focused networking events with pathways for community engagement and volunteerism. For the Corrigans, the passion for philanthropy comes from a deep, spiritual level. The couple chose Big Thought through rewarding personal experience. 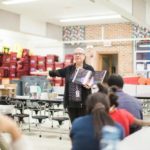 When Alison Corrigan taught at Teach for America, a nonprofit organization in Dallas, and during her time working in Dallas schools, she saw the very students that Big Thought regularly serves. “I really wanted to get involved with this organization in a deeper way,” she says. DeWitt Corrigan, a 29-year-old who owns a tech startup company and also does consulting in that field, joined forces with Big Thought to ensure Dallas’ future. The first general meeting of Big Thought’s Young Professionals Group will be Jan. 27 at 6 pm at Big Thought, 1409 S. Lamar Street, Suite 1015, in Dallas. Membership will be $75 per person or $140 per couple. You can also earn membership by volunteering in three events a year and serving on a committee. Membership provides numerous opportunities to engage in mission-focused events, including volunteer opportunities with Big Thought partners, awareness-building social events, access to meet with leaders in civic and education establishments, and an opportunity to engage with likeminded young professionals. 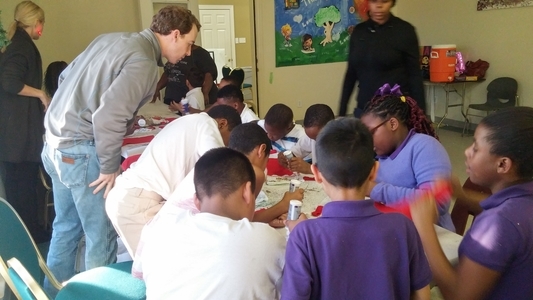 But the ultimate goal remains simple – to impact the lives of children in Dallas. The Corrigans know what many millennials in Dallas and nationally understand – that spreading the philanthropic wealth isn’t just about donating dollars.